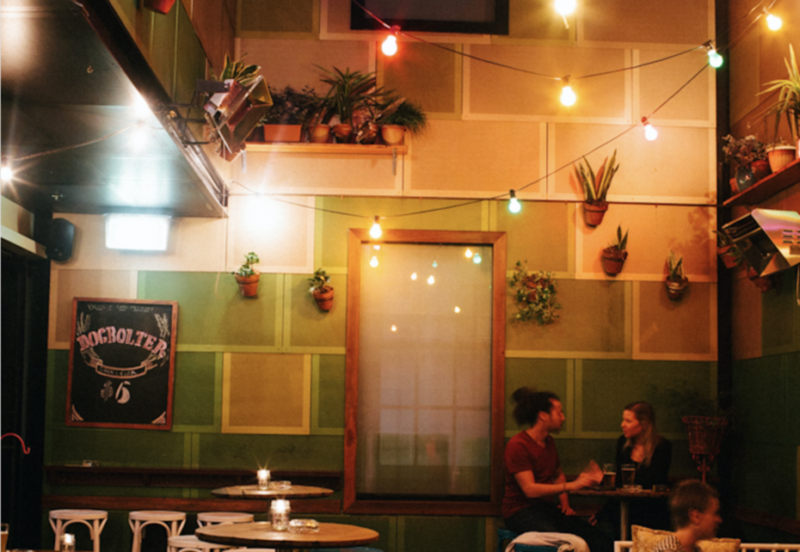 Royal Sovereign Hotel, or the Darlo Bar as it’s more affectionately known to locals, is conveniently located Darlinghurst Accommodation, located at 306 Liverpool Street Darlinghurst and offers quirky, boutique accommodation in the heart of the inner-city. Located close to public transport with Kings Cross train station only a 7 min walk from the hotel and various bus stops within metres from the front door. We’re only 1.6kms from Town Hall, the heart of Sydney. From the moment you step inside the Darlo Bar, you’ll feel at home in the retro and eclectic downstairs bar inhabited by local musicians, artists, and creatives. There’s a pool table, plenty of comfortable couches and our resident food truck that operates Weds-Sun. We also offer an alternative menu featuring some of our local restaurants at all other times in the pub. Upstairs there’s an open air terrace with a vertical garden bar where we grow our herbs for cocktails, or you can try one of our many craft beers in the sun. Vinyl DJS spin soul, funk or blues on Sundays or try your hand against the locals at trivia on Wednesday nights. The accommodation is situated above the pub and there’s a separate entrance from the street if you’d prefer to retreat to your room for some privacy with a bottle of wine from our bottle shop. All rooms have recently undergone renovations and are comfortable, clean and unique, just like the Darlo Bar. There are shared bathrooms and showers that are cleaned daily and rooms are supplied with fresh towels and soap on arrival. There’s a TV, air conditioning, wardrobes and blinds in every room. WiFi is now available in every room. > The Darlo Bar is located in the heart of Sydney on Liverpool Street in Darlinghurst. There is a bus stop right across the street by 7 Eleven where guests can catch a shuttle bus to the Airport and central station. > The Art Gallery of New South Wales is a 20-minute walk from Darlo Bar. The gallery offers a varied collection of Australian and mainly European art as well as several special art exhibitions. Entry is free to all but the special exhibitions. Large cafe/restaurant and museum shop. Something for everyone and well worth a visit. > The Royal Botanic Garden is an oasis in the city. It is not only an excellent piece of history but a fantastic place to see incredible views of the Sydney harbour bridge and the opera house. Many trees, plants, and flowers make the paths a lovely place to wander on a nice day. It is approximately a 30-minute walk or 7-minute drive from Darlo Bar. > The Paddington Markets are on every Saturday morning where Shoppers from all over Sydney come to browse the stalls. There are over 200 market stalls from contemporary fashion and jewellery to retro homewares and original art. They also offer great tasting food stalls. > Oxford Street in Paddington is The village’s famous shopping strip which remains a top destination for restaurants, dining and boutique retailing.